One of the activities Michelle asked us to do was to make a quick diagram of a community we belong to. I chose a group of people who make art together on Saturdays. One of them, Fred, has been making big public art with me for more than twenty years. Another, Fab, has been making big public art with me and Fred for more than ten years. One came along as a friend of Fred’s when they became a couple a few years ago. Another joined a few months ago with her daughter. So I started labeling the strength of the ties in terms of years of shared experience. 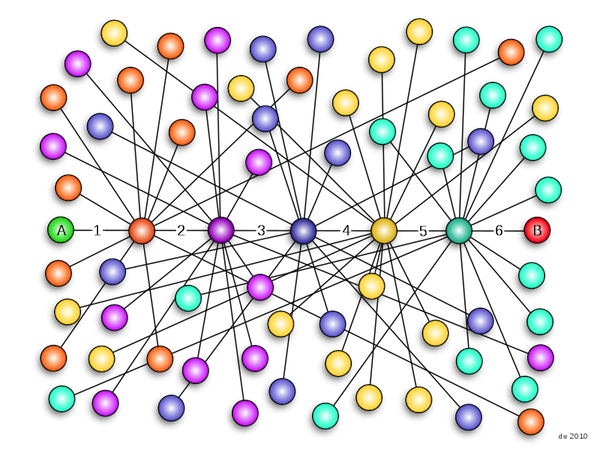 This is a close-up of a group who are tightly knit — we all know each other. 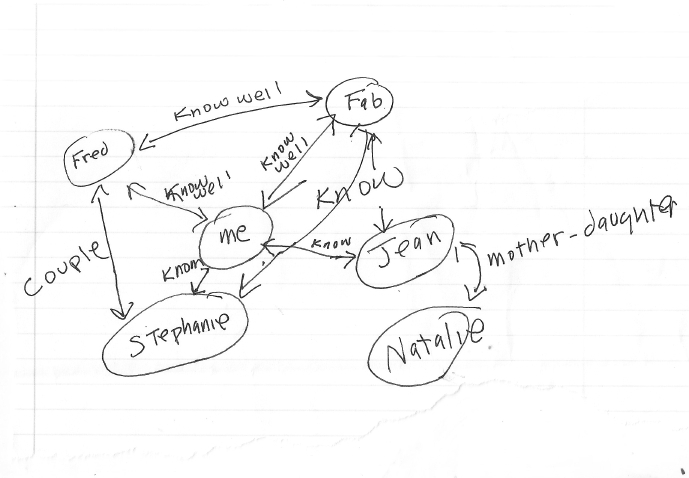 What this sketch does not show is how loosely bounded we are — we each have connections to other groups and networks. Every Saturday, someone from one of our networks shows up, so there is a cloud of more ephemeral relationships that is also not pictured. So I live in a world that includes sparsely knit and loosely bound networks and densely knit and tightly bound groups and communities. This entry was posted in communities and tagged community, networks on January 21, 2015 by Howard Rheingold. On further reflection about the community I chose to diagram in class, I’ve realized that three of the core group originally got to know each other online before becoming face to face friends and that four of the core group now live within walking distance of my house. An example of how we are using media to mix portfolios of groups and networks, strong and weak and latent ties, to fulfill our needs.